Carriers and airport operators are responsible for directing travellers on international commercial flights towards immigration desks for passport and security checks. 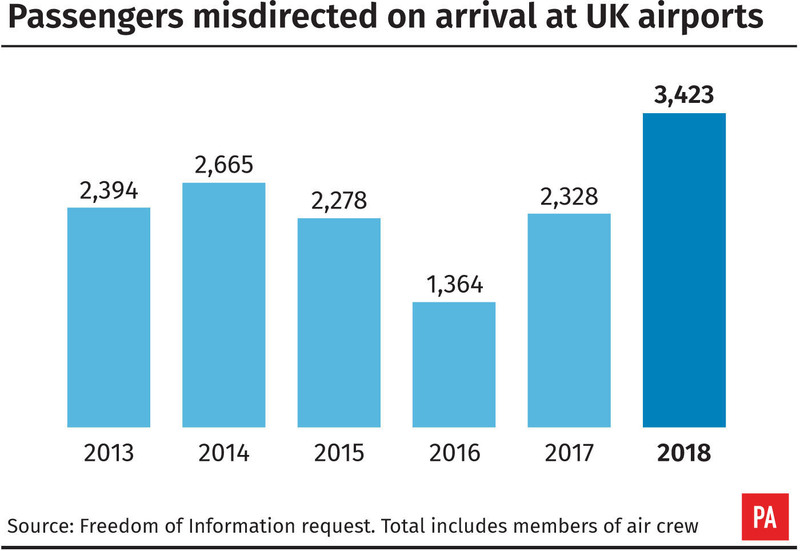 But data obtained by the Press Association shows 2,431 arrivals were not presented to Border Force immediately after landing in 2018 – an average of around six a day. These incidents are logged as “misdirections”. Misdirections are also recorded for cases of “over-screening”, when passengers arriving on a domestic or Common Travel Area flight are sent to checkpoints unnecessarily. Last year, there were 969 people in this bracket. In addition, 23 crew members incorrectly used clearance facilities reserved for operational staff, meaning they did not present at border control as required. Across the three categories, a total of 3,423 individuals were logged as having been misdirected last year. This was a jump of more than 1,000 on the number in 2017 and takes the overall tally in the last six years to nearly 15,000. The Home Office said misdirected passengers are either returned to border control or retrospectively checked against watch lists. Responding to a Press Association Freedom of Information request, the department refused to provide details of last year’s misdirections. It said disclosing information such as dates, flight carriers and airports is “likely to prejudice the operation of immigration controls”. 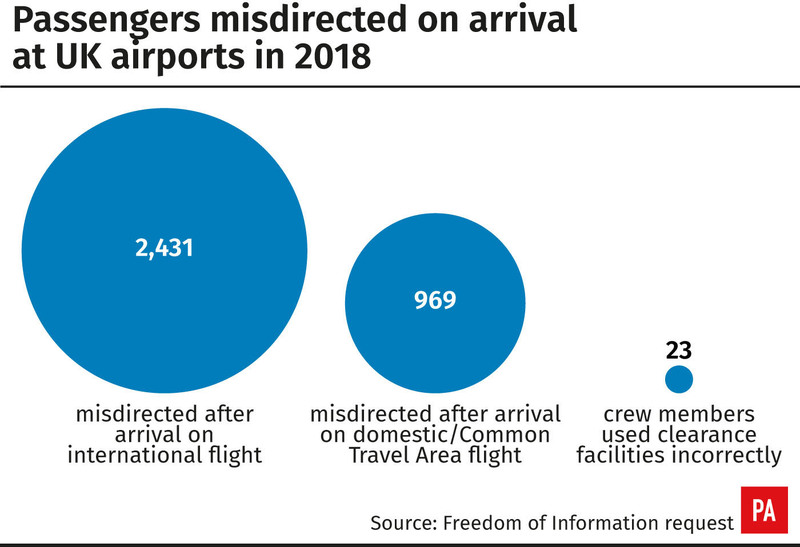 While the circumstances of specific incidents have not been released, Government documents previously stated misdirections usually occur because the wrong doors have been opened at the arrival gate or because the airline or airport operator sent the passenger to the wrong place. Ministers are still weighing up whether to press ahead with plans to impose fines of up to £50,000 on airlines and airports if they fail to take all reasonable steps to ensure arriving passengers are correctly directed to border controls. Legislation paving the way for the civil penalty regime was passed in 2016 and a consultation on how it would work closed more than a year ago. But the Home Office said the next steps are “yet to be decided”. A spokesman for the department said: “The security of our border is paramount, which is why 100% of scheduled passengers are checked when arriving in the UK. “In the small minority of cases where passengers are misdirected they will either be returned to border control or, where this is not possible, retrospectively checked against a range of security and immigration watch lists. Airport and airline representative bodies are opposed to the fine proposals. Airlines UK said: “Whilst any occurrence of a misdirected passenger is unacceptable and must be fully investigated, the total number of incidents remains extremely low in proportion to the growing number of passengers using UK airports. The Airport Operators Association (AOA) said airports take their role in maintaining the UK’s border security “extremely seriously”, and are committed to working with airlines, ground handlers and Border Force to bring down the numbers of misdirected passengers. An AOA spokesman added: “When despite our best efforts a rare misdirection does occur, such as when airline crew or staff from a ground-handling company accidentally direct passengers down the wrong corridor, airports use their full resources to recover this incident as quickly as possible.